Let me start this review by stating that I don’t hate River View as much as most people do. I certainly don’t love it, but it is what it is. River View features a very wacky layout, to say the least. The unconventional scorecard features seven par-3’s, five par-5’s and six par-4’s. So in some ways it’s almost an executive style layout, but it still adds up to a regulation par-70 course. 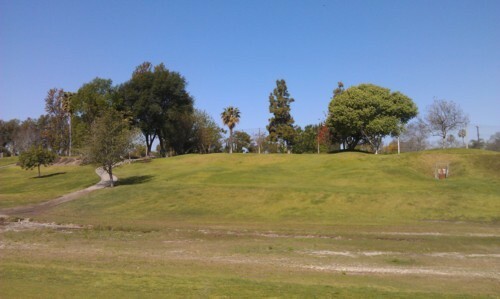 The course zig-zags along and across a riverbed in Santa Ana, which is a very unique feature that can change depending on the seasons (as water levels rise and fall). The course also does NOT favor those who play a big fade (like me). Many holes feature trouble left (trees, OB, hills and fences that often block where I’d normally aim) and fairways that slope to the right toward the river. There are a lot of very uncomfortable tee shots. Then many approach shots are uphill and usually somewhat blind. The carts here do have GPS, which is nice and helpful on many of these funky holes. If you play a high draw (as a righty) or you are a lefty with a high fade, then you should be able to bring this course to its knees. I played River View Saturday morning. With the Masters on TV in the early afternoon and opening week baseball going on, I wanted to play an early morning round. I also didn’t want to have to drive too far or pay too much. 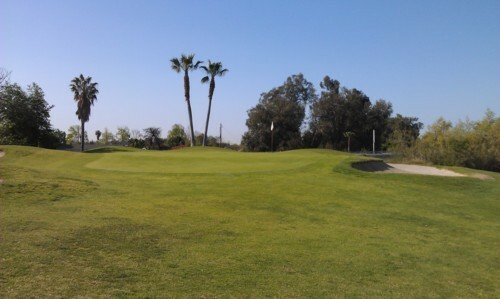 So there aren’t too many options (especially if you want a guaranteed tee time) in Orange County. It usually comes down to a coin flip between the area’s two most despised courses: River View in Santa Ana or Shorecliffs in San Clemente. Both are similar in that they have funky, tight layouts and are not known for having the best conditions. At the same time, both are fairly reasonably priced compared to most OC courses. So when I signed up for my 6:10 time at River View, I knew what I was getting into. I just wanted to play golf, so I lowered my expectations and booked the round. I figured with such an early time, I would also avoid the usual crowds at this course. It was still dark when I got there and I learned that the first three holes are lit (poorly, by the way). I was paired with a twosome and we were second off the tee. Unfortunately, the first group off the tee was a fivesome! That was pretty lame. We did have to wait on them on a number of holes, but they weren’t as slow as I would have feared. All in all, our round took a little under four hours, so not bad out there. 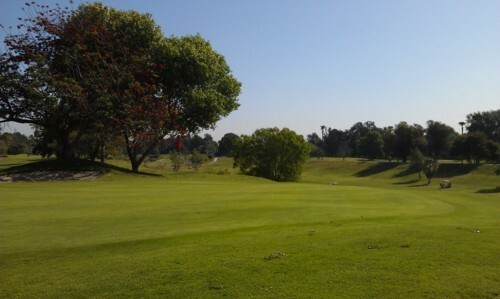 The fairways and tee boxes were sketchy as usual, especially the fairways down on the riverbed level. However, I was pleasantly surprised with the greens. They were some of the nicer greens I’ve played on recently. They were kind of soft and spongy, which made them very receptive on approach shots. Yet, they rolled very smoothly on putts. The fringe and rough grass around the greens were also in great condition. I wasn’t in any bunkers, but they appeared to be in good shape, too. So all in all, the conditions were much better than expected. I will give praise where it’s due. The only other feature of River View to note is the practice area. They have a massive putting green that even has its own little putting course for practice. It’s been awhile since I’ve played here, so I forgot about that. I didn’t have time to practice my putting before the round, but it is a cool feature of the facility. 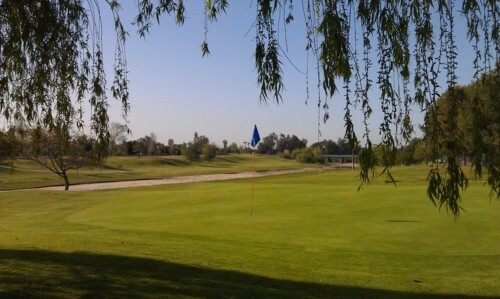 Now, I didn’t bring my camera because I normally wouldn’t bother photographing a course like River View. But just for the Golf Nomad blog, I did whip out my phone a few times and found some nice vantage points.